By the time of the 'Scramble for Africa' in the late nineteenth century, Africa had already been globally connected for many centuries. Its gold had fuelled the economies of Europe and Islamic world since around 1000, and its sophisticated kingdoms had traded with Europeans along the coasts from Senegal down to Angola since the fifteenth century. Until at least 1650, this was a trade of equals, using a variety of currencies - most importantly shells: the cowrie shells imported from the Maldives, and the nzimbu shells imported from Brazil. Toby Green's groundbreaking new book transforms our view of West and West-Central Africa. It reconstructs the world of kingdoms whose existence (like those of Europe) revolved around warfare, taxation, trade, diplomacy, complex religious beliefs, royal display and extravagance, and the production of art. Over time, the relationship between Africa and Europe revolved ever more around the trade in slaves, damaging Africa's relative political and economic power as the terms of monetary exchange shifted drastically in Europe's favour. In spite of these growing capital imbalances, longstanding contacts ensured remarkable connections between the Age of Revolution in Europe and America and the birth of a revolutionary nineteenth century in Africa. A Fistful of Shells draws not just on written histories, but on archival research in nine countries, on art, praise-singers, oral history, archaeology, letters, and the author's personal experience to create a new perspective on the history of one of the world's most important regions. Toby Green has worked widely with academics, musicians and writers across Africa, organising events in collaboration with institutions in Angola, Ghana, Guinea-Bissau, Sierra Leone and the Gambia. He has written a number of previous books, and his work has been translated into twelve languages. Awarded a 2017 Philip Leverhulme Prize in History, he is Senior Lecturer in Lusophone African History and Culture at King's College London. A Fistful of Shells is the fruit of research conducted in the archives of nine nations and required the author to undertake fieldwork across eight West African states. It shows. [...] This is a stunning work of research and argumentation. It has the potential to become a landmark in our understanding of the most misunderstood of continents. A multifaceted history of West Africa which turns many old assumptions on their heads. Green utterly demolishes the tired Western view that Africa had no history before the arrival of the Europeans, and that they naively ceded power in the region to the newcomers by exchanging valuable goods for baubles. A magisterial, extensive and fresh account of the history of West Africa that rewrites the region and its peoples back into World History, where they belong. Toby Green's book restores the rich African history which she had been denied for too long. Here the author reveals that Africa was never at the margins of global commerce but was in fact a decisive player with the prowess to negotiate and also the goods - ivory, gum, gold - to supply. Toby Green's transformative book repositions West African history in an entirely new light. It brings into focus the region's fundamental place in shaping the modern world as well as the powerful and also difficult legacy of this today. Very seldom do I pick up a history book and wish I had written it myself. 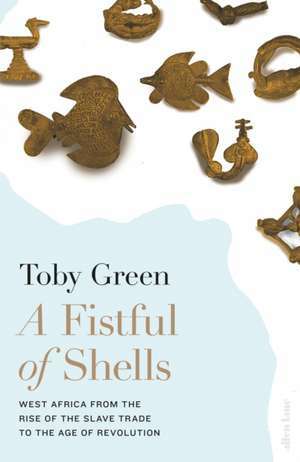 Toby Green's A Fistful of Shells is one such book. Brilliantly conceptualized, beautifully written, Fistful of Shells breaks with colonially configured regional boundaries-which work to re-create unintended silos of knowledge-to imagine a West and West Central African Atlantic history of money, power, religion, and inequality that is as rich as it is sound.